Lost River scarves and jackets are immensely popular because of their wearability and price. Made in Indonesia, and styled by Lost River Trading Company of Utah in a fair trade arrangement, you will want one for yourself, and many to give as gifts! Rayon knit rectangular scarf measures about 14 x 50 inches. The open weave leaves it light and airy when worn loose, but wrap it around for a touch of wind protection. The stretchiness makes it almost like a narrow shawl for the shoulders too! Handwash cool. The pine green color is dark forest that leans a little more toward blue than yellow on the green color wheel. Rayon knit rectangular scarf measures about 14 x 50 inches. The open weave leaves it light and airy when worn loose, but wrap it around for a touch of wind protection. The stretchiness makes it almost like a narrow shawl for the shoulders too! Handwash cool. The sage color is a pretty light green with a sunny hint. Rayon knit rectangular scarf measures about 14 x 50 inches. The open weave leaves it light and airy when worn loose, but wrap it around for a touch of wind protection. The stretchiness makes it almost like a narrow shawl for the shoulders too! Handwash cool. The dusty teal color is a subdued green teal, not quite emerald. Rayon knit rectangular scarf measures about 14 x 50 inches. The open weave leaves it light and airy when worn loose, but wrap it around for a touch of wind protection. The stretchiness makes it almost like a narrow shawl for the shoulders too! Handwash cool. The moss green color is a bright green in mossy shades, a yellow-olive. Rayon knit rectangular scarf measures about 14 x 50 inches. The open weave leaves it light and airy when worn loose, but wrap it around for a touch of wind protection. The stretchiness makes it almost like a narrow shawl for the shoulders too! Handwash cool. The lemongrass color is a very yellow shade of light green. Showing the exact color as it would appear in natural light is next to impossible on the Internet! Please select a color because you like the color range in general, not because you are seeking an exact match. We offer here some comparison between the colors, if that helps! 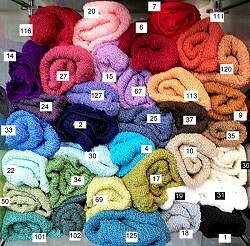 Rayon knit rectangular scarf measures about 14 x 50 inches. The open weave leaves it light and airy when worn loose, but wrap it around for a touch of wind protection. The stretchiness makes it almost like a narrow shawl for the shoulders too! Handwash cool. The guava color is a dark and rich persimmon orange. Rayon knit rectangular scarf measures about 14 x 50 inches. The open weave leaves it light and airy when worn loose, but wrap it around for a touch of wind protection. The stretchiness makes it almost like a narrow shawl for the shoulders too! Handwash cool. The apricot color is sunny tangerine apricot orange. Rayon knit rectangular scarf measures about 14 x 50 inches. The open weave leaves it light and airy when worn loose, but wrap it around for a touch of wind protection. The stretchiness makes it almost like a narrow shawl for the shoulders too! Handwash cool. The dark tangerine color is deep golden orange, darker than the apricot scarf, lighter/brighter than the pumpkin spice. Rayon knit rectangular scarf measures about 14 x 50 inches. The open weave leaves it light and airy when worn loose, but wrap it around for a touch of wind protection. The stretchiness makes it almost like a narrow shawl for the shoulders too! Handwash cool. The pumpkin spice color is a warm and rich golden shade of dark orange cinnamon. Rayon knit rectangular scarf measures about 14 x 50 inches. The open weave leaves it light and airy when worn loose, but wrap it around for a touch of wind protection. The stretchiness makes it almost like a narrow shawl for the shoulders too! Handwash cool. The golden bronze color is a bronzy shade of brown with brighter look. Rayon knit rectangular scarf measures about 14 x 50 inches. The open weave leaves it light and airy when worn loose, but wrap it around for a touch of wind protection. The stretchiness makes it almost like a narrow shawl for the shoulders too! Handwash cool. The raspberry color is a bright fuchsia rose. Rayon knit rectangular scarf measures about 14 x 50 inches. The open weave leaves it light and airy when worn loose, but wrap it around for a touch of wind protection. The stretchiness makes it almost like a narrow shawl for the shoulders too! Handwash cool. The zinnia color is a vibrant rose red. Rayon knit rectangular scarf measures about 14 x 50 inches. The open weave leaves it light and airy when worn loose, but wrap it around for a touch of wind protection. The stretchiness makes it almost like a narrow shawl for the shoulders too! Handwash cool. The scarlet red color is bright and vibrant tomato red. Rayon knit rectangular scarf measures about 14 x 50 inches. The open weave leaves it light and airy when worn loose, but wrap it around for a touch of wind protection. The stretchiness makes it almost like a narrow shawl for the shoulders too! Handwash cool. The pomegranite color is a dark red, like burgundy with light coming through, lots of blue tones. Rayon knit rectangular scarf measures about 14 x 50 inches. The open weave leaves it light and airy when worn loose, but wrap it around for a touch of wind protection. The stretchiness makes it almost like a narrow shawl for the shoulders too! Handwash cool. The baby pink color is a light rose pink, bright and not dull. Rayon knit rectangular scarf measures about 14 x 50 inches. The open weave leaves it light and airy when worn loose, but wrap it around for a touch of wind protection. The stretchiness makes it almost like a narrow shawl for the shoulders too! Handwash cool. The lilac color is a light and bright pink orchid. Rayon knit rectangular scarf measures about 14 x 50 inches. The open weave leaves it light and airy when worn loose, but wrap it around for a touch of wind protection. The stretchiness makes it almost like a narrow shawl for the shoulders too! Handwash cool. The iris color is a light and bright orchid shade of lavender. Rayon knit rectangular scarf measures about 14 x 50 inches. The open weave leaves it light and airy when worn loose, but wrap it around for a touch of wind protection. The stretchiness makes it almost like a narrow shawl for the shoulders too! Handwash cool. The plum color is a medium dark purple, a bit more red than blue. Rayon knit rectangular scarf measures about 14 x 50 inches. The open weave leaves it light and airy when worn loose, but wrap it around for a touch of wind protection. The stretchiness makes it almost like a narrow shawl for the shoulders too! Handwash cool. The purple color is a rich bright amethyst purple. Rayon knit rectangular scarf measures about 14 x 50 inches. The open weave leaves it light and airy when worn loose, but wrap it around for a touch of wind protection. The stretchiness makes it almost like a narrow shawl for the shoulders too! Handwash cool. The blueberry color is a bright periwinkle between bluebells and light violet. Rayon knit rectangular scarf measures about 14 x 50 inches. The open weave leaves it light and airy when worn loose, but wrap it around for a touch of wind protection. The stretchiness makes it almost like a narrow shawl for the shoulders too! Handwash cool. The sky blue color is light aqua blue. Rayon knit rectangular scarf measures about 14 x 50 inches. The open weave leaves it light and airy when worn loose, but wrap it around for a touch of wind protection. The stretchiness makes it almost like a narrow shawl for the shoulders too! Handwash cool. The denim blue color is a medium indigo wash color, a blue with gray tones. Rayon knit rectangular scarf measures about 14 x 50 inches. The open weave leaves it light and airy when worn loose, but wrap it around for a touch of wind protection. The stretchiness makes it almost like a narrow shawl for the shoulders too! Handwash cool. The turquoise color is richly saturated and bright. Rayon knit rectangular scarf measures about 14 x 50 inches. The open weave leaves it light and airy when worn loose, but wrap it around for a touch of wind protection. The stretchiness makes it almost like a narrow shawl for the shoulders too! Handwash cool. The deep peacock color is a rich teal blue, dark turquoise. Read about what others think of Lost River scarves! Instead of reviews for a specific product, this is a place to share about the designer line in general.